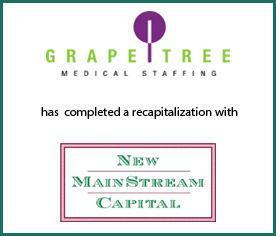 GrapeTree Medical Staffing (“GrapeTree”), one of the fastest growing and largest nurse staffing providers in the Midwest, has completed a recapitalization with New MainStream Capital (“NMS”). GrapeTree’s service offering includes CNA staffing in nursing homes and assisted living facilities, as well as LPNs and RNs in hospitals. GrapeTree will serve as the platform investment in NMS’ effort to build an industry-leading provider of CNA and RN staffing to long-term care facilities and hospitals on both a per diem and contract basis. GrapeTree provides experienced, qualified professionals for as little as a single eight-hour shift or as long as a typical 13-week contract nursing assignment, and fulfills all of these needs from its headquarters in Milford, Iowa. With a focus on delivering a higher level of customer service, GrapeTree utilizes a vendor management platform that significantly improves fill rates by using its large network of affiliate suppliers, and automates delivery to enable the company to provide exceptional customer care. The strength of the GrapeTree model is evident in its growth – in 2017 the company will serve more than 600 individual facilities, an increase of over 10% from 2016, and the total number of healthcare professionals who worked at least one GrapeTree shift doubled to over 1,600 in the same period. “GrapeTree has a truly exemplary staffing model which is supported by best-in-class technology, providers, and workplace culture. This deal will help Tim and his team achieve their growth objectives and expand their model nationally,” noted Michael Fassett, Analyst at Provident Healthcare Partners. “The GrapeTree Team has built the best in class technology enabled staffing solution to fulfill orders for local, shorter duration assignments, which has traditionally been underserved. With the resources and experience of NMS, GrapeTree is well positioned to expand its model nationally,” stated Steven Aguiar, Managing Director at Provident Healthcare Partners. Provident Healthcare Partners served as exclusive financial advisor to GrapeTree. The terms of the transaction were not disclosed. Founded in 1999 by travelling RN Tim Kinnetz, GrapeTree Medical Staffing is a healthcare staffing agency that provides staffing solutions to healthcare facilities across the Midwest by providing healthcare professionals to fill last-minute or long-term shifts left by staffing shortages. GrapeTree is rated one of the top 10 most reliable staffing firms in the Midwest and is certified by The Joint Commission, recognized nationwide as a “Gold Seal of Approval” and a symbol of quality that reflects an organization’s commitment to meeting high performance standards. Inc. magazine just ranked GrapeTree Medical Staffing #665 on its 36th annual Inc. 5000 list, the most prestigious ranking of the nation’s fastest-growing private companies. GrapeTree was also once again honored in 2017 as one of America’s fastest growing staffing firms by Staffing Industry Analysts. GrapeTree ranked #1 for Iowa/Midwest, #10 for healthcare staffing firms, and #12 for all staffing firms on the list of Fastest Growing U.S. Staffing Firms. For more information, visit www.grapetree.org. New MainStream Capital is a New York headquartered private investment firm specializing in strategic equity investments and leveraged buyouts of lower middle market companies. The firm was formed through the spin-out of a group of portfolio companies from the Goldman Sachs Merchant Banking Division. NMS focuses on companies headquartered in the U.S. poised to benefit from sustainable growth trends with particular concentration on companies in Healthcare Services and Specialized Business Services. For more information, visit www.nms-capital.com.